This dynamic comic turns heads immediately with his kinetic performance and infectious energy. The unique style and irrepressible showmanship that took this “one to watch” from his first open mic to touring headliner in two years, leaves audiences in stitches. 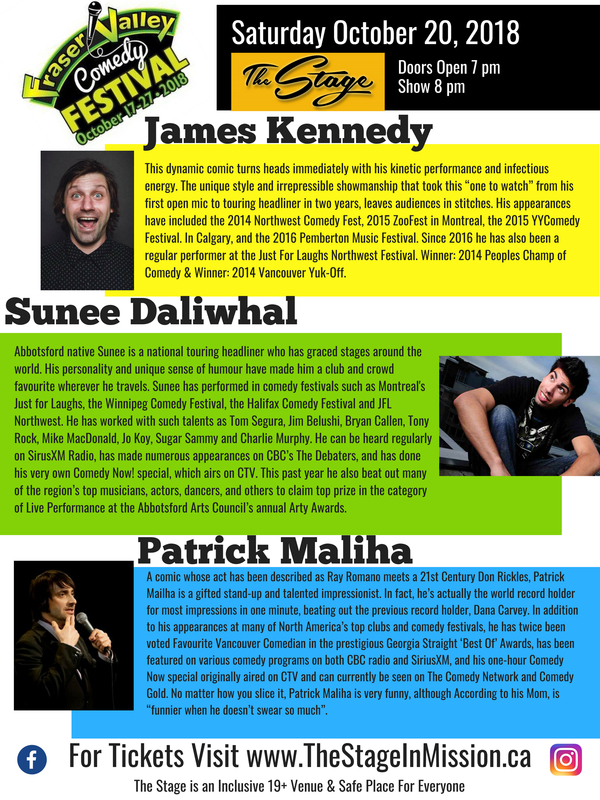 His appearances have included the 2014 Northwest Comedy Fest, 2015 ZooFest in Montreal, the 2015 YYComedy Festival. In Calgary, and the 2016 Pemberton Music Festival. Since 2016 he has also been a regular performer at the Just For Laughs Northwest Festival. Winner: 2014 Peoples Champ of Comedy & Winner: 2014 Vancouver Yuk-Off. Abbotsford native Sunee Dhaliwal is a national touring headliner who has graced stages around the world. His personality and unique sense of humour have made him a club and crowd favorite wherever he travels. Sunee has performed in comedy festivals such as Montreal’s Just for Laughs, the Winnipeg Comedy Festival, the Halifax Comedy Festival and JFL Northwest. He has worked with such talents as Tom Segura, Jim Belushi, Bryan Callen, Tony Rock, Mike MacDonald, Jo Koy, Sugar Sammy and Charlie Murphy. He can be heard regularly on SirusXM Radio, has made numerous appearances on CBC’s The Debaters, and has done his very own Comedy Now! special, which airs on CTV. This past year he also beat out many of the region’s top musicians, actors, dancers, and others to claim top prize in the category of Live Performance at the Abbotsford Arts Council’s annual Arty Awards. A comic whose act has been described as Ray Romano meets a 21st Century Don Rickles, Patrick Mailha is a gifted stand-up and talented impressionist. In fact, he’s actually the world record holder for most impressions in one minute, beating out the previous record holder, Dana Carvey. In addition to his appearances at many of North America’s top clubs and comedy festivals, he has twice been voted Favourite Vancouver Comedian in the prestigious Georgia Straight ‘Best Of’ Awards, has been featured on various comedy programs on both CBC radio and SiriusXM, and his one-hour Comedy Now special originally aired on CTV and can currently be seen on The Comedy Network and Comedy Gold. No matter how you slice it, Patrick Maliha is very funny, although According to his Mom, is “funnier when he doesn’t swear so much”.